Premiere Shannon Festival, Limerick Cathedral 13.7.2007. (2004) 2121 2221 3 perc hrp pf str. Premiere: Living Arts Festival, February 2005. 2121 2221 3 perc hrp pf str. 10′. 0020 1001 ssax asax tsas, perc, acc, pf, str. Premiere NSOI in ‘‘Horizons ’’Concert, March 8, 2005. 1111 1000 perf pf str. 15′. Commissioned by Cantus from the Irish Arts Council (2002). of Vis, Dalmatia, Cantus Ensemble / Berislav Sipus. World Music Days , April 2004. National Symphony Orchestra of Ireland, conductor Colman Pearce. Premiere: 30 January 2001. National Concert Hall, Dublin. National Symphony Orchestra of Ireland, conductor Richard Pittman. with funds provided by the Arts Council/An Chomhairle Ealaíon. Premiere: 22 June 1995. Cork. Irish Chamber Orchestra director Fionnuala Hunt. Irish Chamber Orchestra, director Fionnuala Hunt. Premiere: 10 November 1981. Vienna. Commissioned by the Dublin Festival of Twentieth Century Music. Premiere: 9 January 1984. National Concert Hall, Dublin. New Irish Chamber Orchestra, conductor David Robertson. Recording: Composers’ Art Label CD 2005. Three Pieces for Orchestra (1974 rev. 2222 4331 timp perc str. RTE REC. ( N.S.O. / Richard Pittmann ) 2000. String Quartet plus Clar. / Bassclar. Flutes, Soprano, Speaker, Harp, Piano, Percussion, Electronics. 10′. Premiere: 12 October 2000. Expo 2000, Hannover, Germany.The Crash Ensemble. Sligo Contemporary Music Festival, Model Arts and Niland Centre, Sligo. (cl), Michael Jones (bn), Fergus O’Carroll (hn). Incontri Europei con la Musica, Italy. Premiere: 1 February 1997. Bergamo, Italy. I Fiati Aperti, conductor Giuseppe della Valle. Commissioned by Minister of Culture, City of Hamburg, Germany. Premiere: 26 February 1995. Kunsthalle, Hamburg. Premiere: 20 September 1994. Brussels. Cappelletti Quartet. Premiere: 1 February 1995. Tonhalle, Düsseldorf, Germany. provided by the Arts Council/An Chomhairle Ealaíon. Commissioned by Jubal String Quartet. Premiere: 10 October 1978. National Gallery of Ireland, Dublin. Les Amis de la Musique. Stuttgart Wind Quintet, director Willy Freivogel. 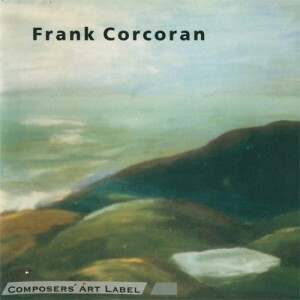 Self Help – Frank Corcoran OIO . for Allan von Schenkel 2005. Commissioned by Lyric Fm 2004. Premiere: 1990. Chicago, Illinois, USA. Contemporary Music from Ireland, Volume Two. Istituto Polacco di Cultura, Rome, 2.6.1996. Aisling Drury-Byrne, vcl. and Frank Corcoran, pno. The Arts Council/An Chomhairle Ealaíon. Premiere: 22 January 1998. Hamburg, Germany. Das Neue Werk NDR Ensemble,conductor Dieter Cichewiecz, Frank Corcoran (speaker). Goethe Institute Choir, conductor: Cáit Lanigan-Cooper. Premiere: 13 May 1980. Sender Freies Berlin. with funds provided by the Goethe Institute, Dublin. Premiere: 5 May 1973. Cork International Choral and Folk Dance Festival. Choir of the Goethe Institute, conductor Cáit Lanigan-Cooper. Premiere: First Broadcast 18 January 1973. RTÉ. Premiere: 2 August 1999. WDR, Cologne. Premiere: 10 June 1997. WDR, Cologne, Germany. WDR Studio Acoustic Art Prize 1995. Commissioned by RTÉ for the Priz Italia 1982. Premiere: 1980. Seoul Festival, Korea.